Finally a really beautiful day. We were outside most of the day. Late this afternoon, though, we came inside for a break. 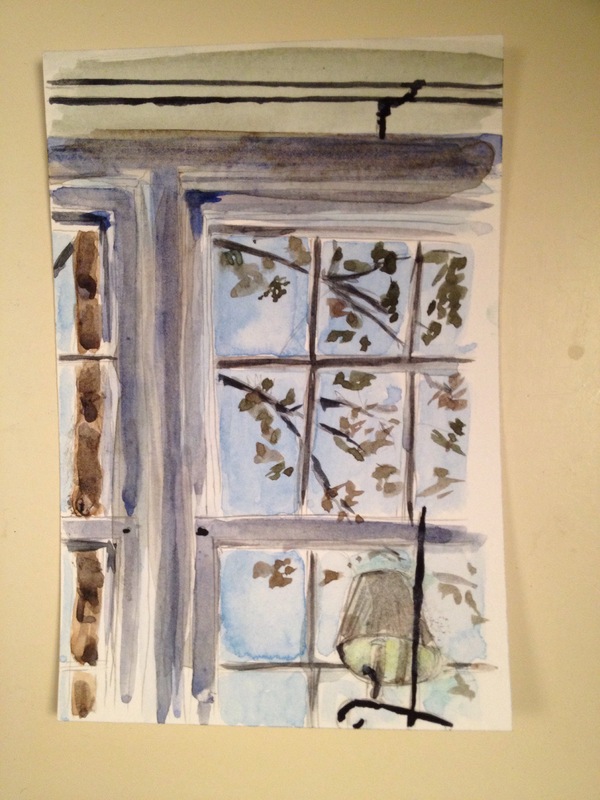 I took the opportunity to sketch the window and the view outside. It was difficult sorting out the backlit window frame, which I overworked in my attempt, and I wrecked the color of the light through the lampshade, but I thought it worth posting the attempt if for no other reason than to emphasize how hard it is to get the color of light on a white surface sorted out properly, especially with backlighting. I also got a sample of Stillman and Birn sketchbook paper in the mail yesterday. I tried this on the Zeta paper, which is very smooth and 180lb. I am not really used to smooth paper for painting, so that was an extra variable to consider, but it was good stuff. I think the rougher Beta paper will be more to my liking for watercolor(it’s weird having no resistance on the brush stroke), but this would be great for ink work I think. You always capture the feel of a place in your sketches. I have myself seated in this scene as I take in the window.